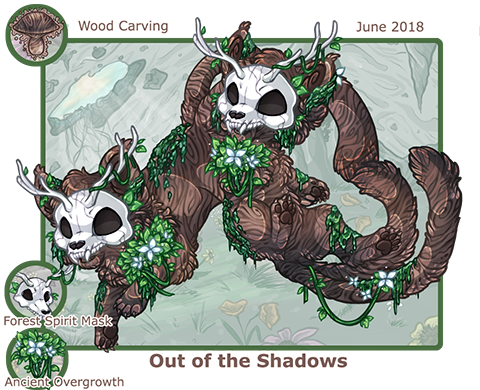 This month’s OotS is Wood Carving, along with their frightening Forest Spirit Mask and probably very itchy Ancient Overgrowth. This set was created by the magnificent Meru! You can find it for sale in the Out of the Shadows shop through the end of the month! May’s Creative Collective has drawn to a close! Thank you to everyone who posted a submission, engaged in a roleplay, or offered some feedback this past month. May’s submissions are in the process of being compiled, and June’s prompts should be up shortly. Two new items have also been added into the Bag of Wonders! Our Misc. Images page has received a much-needed update! It’s been slightly reorganized, with images now tucked into spoilers to help with loading time. Full size images of the site background items have also been added. We hope you continue to enjoy these resources! Several new items can now be found stocking in the shops around Mycena Cave! Black Flutter Wings and Black Ruff can be found in Val’s Modern Composition, while Puffy Clouds, Sky Background, and Moonlit Clouds Background can be found in Lands Within. We are now seeking players to help us beta test our upcoming Adventure system! If you enjoyed our Quest for the Icy Soul event and are interested in helping us hammer out a new feature for all of Mycena Cave to enjoy, check out this thread for information on how to apply! For our full explanation as to why this change is occurring, please see this announcement. In an effort to help boost our economy, we have been considering ways in which we may update the marketplace to increase its utilization. To this end, we have released a new survey aimed at gauging which features our community would most like to see in a marketplace revamp! Our Spring Event has come and gone, and thanks to your careful bouquet-making, the Cave is looking springy and bright after a long, dreary winter! Seelby would like to extend a warm ‘thank you’ to everyone who participated — with all of the leftover seeds she managed to collect, she should be able to keep the Cave beautiful for quite some time! June 21st marks the first day of summer, and with a new season comes a new Seasonal coat! Bruc is still tending to his new crop of mushrooms, but keep an eye out for upcoming previews. Meanwhile, you still have a few weeks to swipe up those Spring Seasonals before they disappear until next year! Summer is too hot for us! As we make the final preparations for our adventuring beta program, adventure threads from the Quest for the Icy Soul event are going to stop listening for commands. If you haven’t finished your RP you’re welcome to continue posting in your threads, but there won’t be any more replies from the Bone Monster. Head over there every day to collect a daily bonus of between 50 and 100 nuggets (depending on how often you’ve collected over the last week)! This’ll take some getting used to, but I’m excited to see what new changes it’ll facilitate for the Cave in the future! I’ve never lost anyone’s money before. Bruh. That’s… *squint* a very specific reassurance. Verrrry specific. Does our banker have something to hide? -edit- Ooh and I really like that lil auto-deposit going on! That it sees how much nuggets we have on hand and assumes we wanna deposit them all. That’s neat.